One of the prompts they presented for the link-up was "What I Thought I'd Be Writing About When I Started." This one really got me thinking about the humble beginnings of Hollow Tree Ventures (Yes, once things were even humbler around here than they are now! Or is it "even more humblerer?" Either way, it's hard to believe! ), and I realized something. I had already completely forgotten that this isn't even what I meant to do. I don't remember what first gave me the idea, Hey, I think I'll start a blog, because at the time I wasn't 100% sure what a blog was (let's not forget what an Innerwebs Dunce I am). But I do recall it had something to do with starting a project with Gerry, something we could work on together, though we hadn't quite settled on its exact purpose yet. Maybe we'd send each other public-ish letters (since in our courting days we had a "hollow tree" where we sent each other love notes - but that's a story for another time), or maybe we'd use it as a platform for showing off his T-shirt designs. So while we were making up our minds about what HTV would eventually be, I stumbled around blindly inside my computer, eventually figuring out how to design the background. I created a title banner, and changed the font eleventy times, and started constructing static pages. I made little icons to click on to get to the pages, and fussed over the colors, and before I knew it I was a little bit in love with the stupid thing. The look of it was very "me," and as I timidly began to add posts (just passing time until we decided on its True Purpose, mind you) HTV started to take on my voice, as well. I was nervous about putting all my Crazy out there, until I reminded myself, Duh, no one even knows this blog exists. So with the freedom of relative anonymity (in a public forum sort of a way) I wrote about life with the new baby around, documented some funny things the kids said, and ranted a lot (A LOT) about things that were driving me crazy. As time went on, more and more of my true sarcastic and snarky nature seeped through the keyboard and onto the screen, and in the blink of an eye the time had long since passed when Gerry could've thrown in his two cents (luckily, he was fine with that). Hollow Tree Ventures had become my space, a place where I could yammer on endlessly about whatever I wanted to say, and where I could exercise those saggy, shriveling brain cells that used to love helping me write in college. I was rediscovering a part of myself that had been shelved when I had kids, and through the blog I found I was able to combine the Old Me and the Mommy Me. These days, I'm constantly amazed and flattered that anyone tunes in to read my little pasted together words, especially those who aren't required to by Genetic Guilt. It's awesome. Truly. And to think, it all started with a poorly formulated idea and a lack of a plan. Just like the rest of my life - one happy mistake after another. on a global campaign to make "blogaversary" a real word. First of all, that first pictures is absolutely priceless. Seriously. I melted like I usually only do for cute animal photos. So glad you're in blog land! Abby - I HAVE A THEME?!?! Well, you can chalk that up to unintentional brilliance, then. :) And I put you to shame in no arena known to man - your blog is Awesomeness in E-Form, with your pretties and funnies and Real Actual Writing! BTW, I'm glad you're in blog land, too! How sweet! I love how your wrote about this for the prompt. I am thinking about doing this prompt, but still trying to decide exactly what I want to say. You said YOURS beautifully. Thanks for linking up! And happy to meet you. 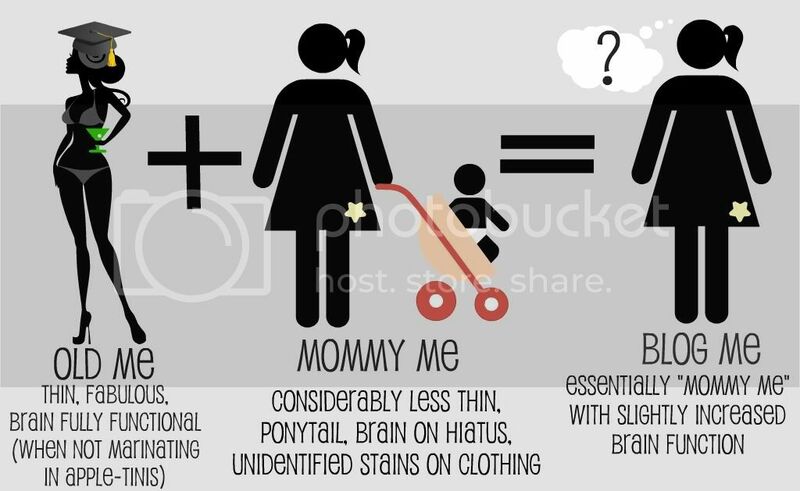 I loved your graphic of the before mom and the after kids mom. I am SO that lady. Where did my body go? lol. But, honestly, I wish I could get any brain function back when I sit down to the computer to write. It waxes and wanes like the moon and never when I'm ready to write...but at 2:00 a.m. in the morning or something. Me too, Cricket - at 2 AM when inspiration strikes, I'll try to eversoslowly reach for my phone, open the notepad, and squint at the screen (I'm half blind without my contacts) as I type in my genius idea. Then the next morning I read it and I'm like, "'Chicken bumps had stop sign?' What does that even mean?" Sigh, the moment's gone. I find it incredibly romantic that you and your hubby left each other love notes in a hollow tree. That's like something out of a Nicholas Sparks movie. I LOVE it. THAT has got to be the cutest baby pic EVER!!! Soooo adorable! How could you ever say no to that face?? Thanks for linking up with us, Robyn! Glad you finally managed to finish writing (what did you do to quiet the baby down? ;). I'm always curious about the story behind each blog, and yours is a sweet one! Thanks for sharing the story of how you started and came to be. I've enjoyed reading your posts the past few weeks via bloggercommentclub =) So keep at it! Jamie, thanks for the kind words of encouragement, and for coming back to visit! Love the graphic! Sadly, in my mind I am still the pre-kids me picture until I see myself in the dressing room mirror! 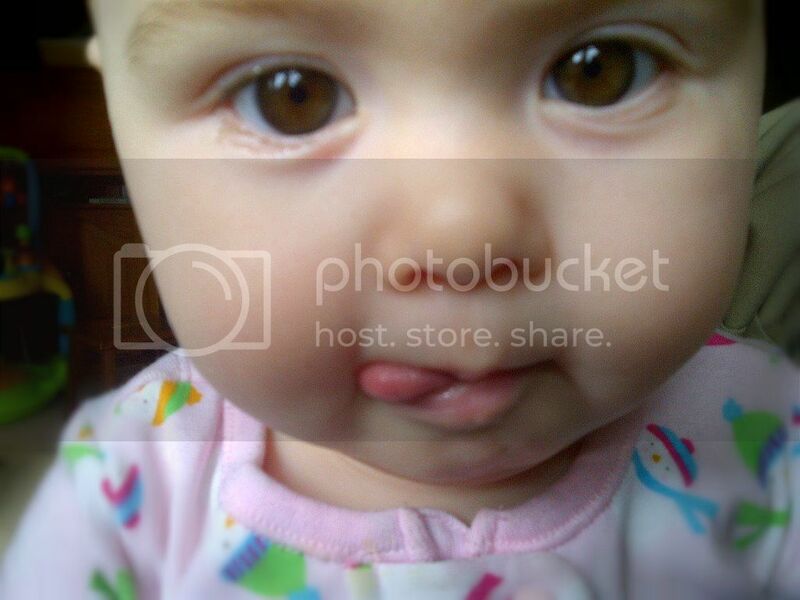 And the baby picture is too cute. I often wonder how embarrassed my boys will be with their photos all over my blog! mammabearsworld - nooooo, not the dressing room mirror! I haven't seen myself in one of those for ages, because I always have some kid between me and the mirror dancing around and pretending to be a rock star, or dressing up in the clothes I'm attempting to try on. It's probably for the best that way, though. My favorite phrase from this post? "seeped through the keyboard and onto the screen"
...because that's EXACTLY what happens when we write. It all comes out. Thanks, Woven Moments - it sure is what writing feels like, isn't it? I appreciate you stopping by - happy blogversary! I love that you combined your "Mes." Really, we should all be doing that! I want to hear more about your hollow tree. Was it an actual hollow tree? Because that is too delicious for words. Galit, I'm glad you agree sarcasm should be out in the open- "Free the Snark Within," that's what I always say! From Tracie, I thank you from the bottom of my heart for reminding me about Bob Ross. "I got a happy little tree right over here..." No, it was a figurative hollow tree, mostly because I was pretty much housebound at the time so traveling to trees wasn't an option. But same idea - star-crossed lovers, forbidden to see each other, etc. The most magical, eye-opening, life changing, and horrendous time of my life. Love the idea of the hollow tree to leave notes in!! Leighannn, I completely agree - thanks for being here! I had a similar experience of feeling completely divorced from my former self after having kids. Blogging is one of the things that helped me start making sense of that shift and adjusting (to whatever extent I could. )It's an ongoing process. Luckily blogs live forever. Christine, it sure is an adjustment, isn't it? You hardly recognize yourself after the kids come, but then you hardly recognize yourself without them. Oh man, marinating in appletinis. It's amazing to think that we had more brain function in those days!